As summer winds down, so does the first season of the Lynn commuter ferry, but a group of avid riders are hoping for an extension that would have them sailing into the fall. Launched in May, the ferry is a two-year pilot program that is being funded by the state. Economic Development Industrial Corporation Executive Director James Cowdell said he’s already extended the season from the original end date of Sept. 12 to Sept. 26. “We had a party that day,” Ercolini quipped. The number of Lynn ferry riders has more than quadrupled since the boat’s maiden voyage in May. Economic Development and Industrial Corporation Executive Director James Cowdell said the passengers are mainly commuters. Ercolini and Laura Patrick would like to see the schedule coincide with the end of whale watching season, which typically runs to mid-to-end of October. They have collected nearly 200 names on a petition who feel likewise to back up their request. Ercolini said the ferry is docked in Lynn at night, so it would have to return to Boston each morning anyway because it is also used for whale watching trips. She argued that the extension could be limited to the most popular runs, the 8 a.m. trip into Boston and the 5:45 p.m. return. Cowdell said the success of the ferry doesn’t surprise him, but the sheer exuberance of the riders does. He also said he agrees with the riders that it should be extended, but it’s not likely to happen this year. “The only way that happens is if the state steps in and agrees to fund us, and I don’t think that will happen,” he said. 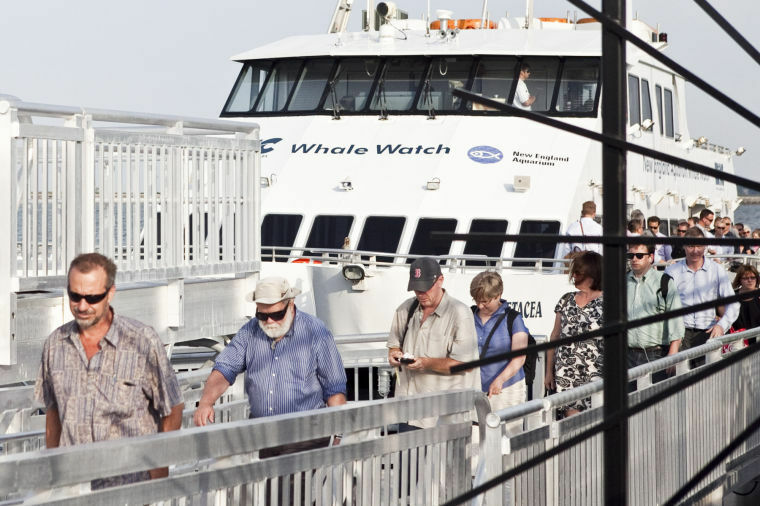 Ridership has gone up consistently every week to the point where more than 10,000 passengers have used the ferry so far this summer, Cowdell said. The hope is the ferry will remain as popular next year, so at the end of two years when they ask for funding for a year-round ferry, they will have the numbers to prove it would be a success, he explained. Ercolini isn’t sure a year-round ferry would work in open water, but she is willing to give it a shot because her backup commute doesn’t hold a candle to ferry life. Before the ferry, Ercolini, who lives in Revere’s Point of Pines neighborhood, said her husband would drive her into Boston each morning and she would take the train home at night. Taking the ferry has absolved her husband of the pressures of dealing with traffic and her of the crowded trains. On the ferry, “You’re never late, and there’s never any traffic,” she said. Even when the ferry ran aground last week stranding passengers for 90 minutes, Ercolini said commuters took it in stride. “I wasn’t on the boat, but the next morning I asked a woman about it, she said, ‘We were a little late getting in, but it was a nice night,’” she said. While he hopes things will change in the future, Cowdell said the commuter ferry will close for the season on Sept. 26 but will reopen in May.